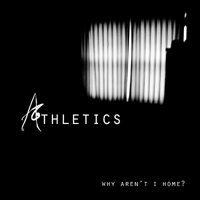 Deep Elm Review Of 2010: Athletics - Why Aren't I Home? Athletics is reminiscent of the kid in school who talks only when he has something important to say, yet is extremely brilliant. Often only having a few lines of lyrics in a song, Why Aren't I Home? focuses more on the ambient atmosphere of a song, while speaking enough to relay the powerful messages of the song. The title track features the usual post-rock buildup, ambient guitars soaring, the rhythm section feeling like a driving train, before the climax hits with one line of powerful vocals. Vocalist and guitarist Garrett Yaeger launches in to state the powerful message of the title track and maybe the whole album, shouting "Well I'm lost again, as my world finds it's end. No safe place to exist, but to pretend we never did." Flowing seamlessly into the much heavier "See You On The Other Side", as the flowing ambient guitar riffs support the lower, heavier crashes of sound. The surprisingly vocal heavy "Jordan" is a powerful self reflection, while "Lullaby" is anything but one with angry vocals glaring from behind the atmosphere. "It's Night, It's Enough" seems to be one of the more mellow songs on the album, until you reach the halfway point of the song. A large, powerfully emotionally scream of "You haunt my dreams." begins the powerful blast of sound that erupts through one's speakers. "The Cost Of Living" closes the album with depressive lyrics, though powerful, leaving chills as the album quickly fades away. Why Aren't I Home? is an adventure through the powerful distresses of the band. It strays away from usual post-rock, yet keeps the aspects of the genre that makes it all great. The vocals are the last key that makes the record more than just an emotional journey, but a journey in every such way, as it will leave you breathing heavily, sweating, and questioning reality. You can stream the album on the band's Deep Elm page here. You used some variant of the word "powerful" eight times in a three hundred word review. Good job. Oh cool, a comment on something I wrote a year and a half ago. But yes, now that I'm reading it, I should have fixed that up, hah.